I was extremely excited when my review copy of Chickens as Pets arrived! It had been much anticipated and I knew first-hand from Andrew the love, time and care he had put into writing it. So it was no surprise that I devoured it in one sitting and can happily say that it was worth the wait! The chapter titles are quirky and amusing but the contents pack a weighty punch, full of facts, explanations, personal advice and Andrew’s passionate views on animal welfare. Much to my delight ex-battery hens feature highly in this book - naturally I am biased as I think they are the very best type of hen – there is much information throughout the book on ex-batts; welfare issues, commercial poultry keeping and the beautiful story of Emily, the depressed ex-battery hen who through amazing and tender care, discovered how good life should be for a hen. All this is so important, this lovely book is going to become a bible for chicken keepers and the more people that can learn about ex-battery hens and are inspired to rehome them the better! There is much in depth information on treating sick hens and I think these are possibly the most important chapters for prospective, new and experienced chicken keepers. We can all learn something from Andrew’s advice and experiences; I had never thought of using soya milk to help induce egg contractions!! Now I will try it every time. funny because they are so painfully true to life and something every hen keeper can relate to. 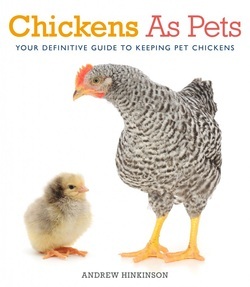 I see this book doing great things; by not only ensuring henkeepers have a concise and reliable point of reference but also by promoting the wonders of keeping chickens as pets.